Following meeting with Israeli counterpart, National Security Advisor hails US-Israel strategic partnership. US National Security Advisor John Bolton on Monday met with his Israeli counterpart in Washington, DC. Following the meeting, Bolton praised the security relationship between the US and Israel in a post on Twitter. “Great meeting with Israeli National Security Advisor Meir Ben-Shabbat today. The close United States-Israel strategic partnership reflects the tremendous strength of the ties between our governments and the citizens of our two allied countries,” he wrote. Bolton visited Israel in January and met Prime Minister Binyamin Netanyahu. During the meeting he hailed the relationship between Israel and the US under the Trump administration, saying the bond between the two countries had never been stronger. 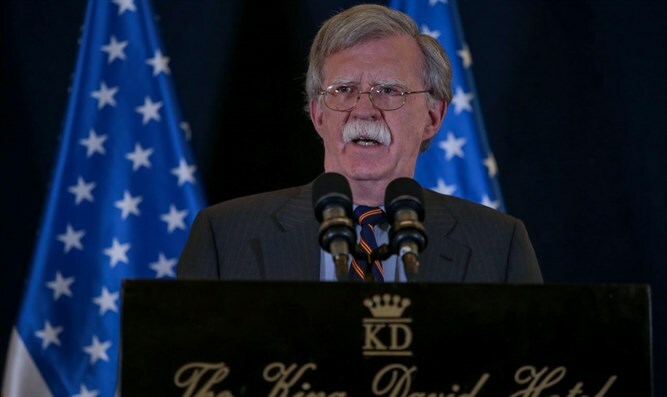 “The leadership that’s necessary in what is increasingly…a very critical time for security here in the Middle East and us around the world, requires that strong bond and leadership that you and the president provide,” said Bolton, citing Iran’s nuclear program, the Syrian civil war, and the Islamic State (ISIS) terror organization.